Don’t you just love when all the stars align? I felt that way about this week’s recipe challenge for Cook the Book Fridays. On the tail of last month’s delicious Counterfeit Duck Confit, in January, we are continuing the celebration with A Month of Duck. 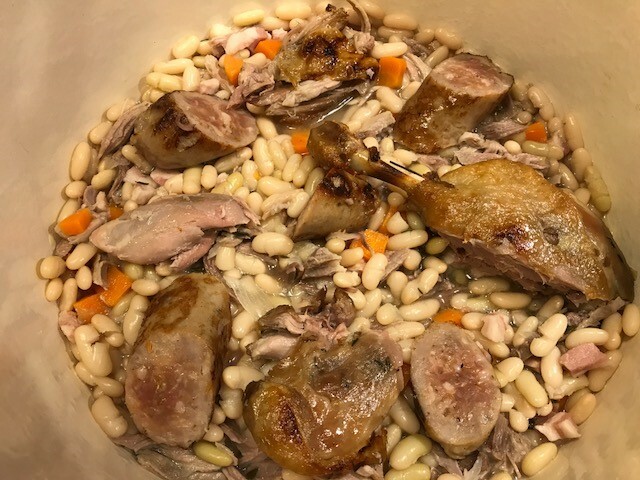 We made Duck-Fat Potatoes two weeks ago, and this month, the pièce de résistance, White bean, sausage, duck confit casserole aka Cassoulet! What does cassoulet have to do with aligning stars? First, an opportunity to buy some freshly dried beans arose. Baer‘s Best is a local company that sells New England grown dried beans. 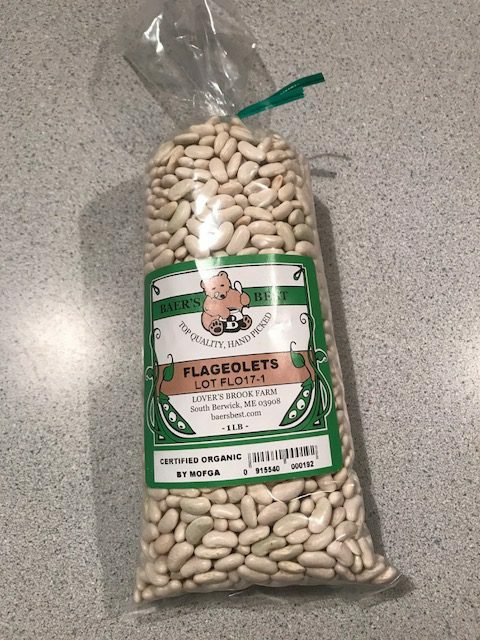 I bought a pound of flageolet, a slender ivory bean that is an immature kidney bean. Next, the counterfeit duck confit we made sparked a dinner with friends where Howard made his own version of sous-vide duck confit. We made extra to save in the freezer for later. That could be enough serendipity, but there’s more. When I made shopping list to pick up the remaining ingredients, ham hock didn’t seem like it would be the stumbling block. 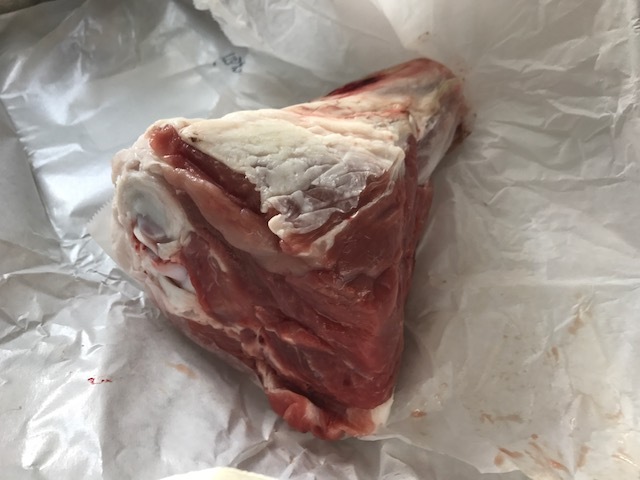 I already knew from some of the other cooks that I was unlikely to find a fresh ham hock, but that a smoked one would be fine. I always seem to see smoked ham hocks at the grocery store. Well, not that day I went shopping. No worries. We had plans to be in Boston for the day, and it would be easy to stop in another grocery store on the way home. In Boston, walking from the parking lot to the theatre, I noticed a butcher shop. I’d read about its recent opening and promptly forgot about it. 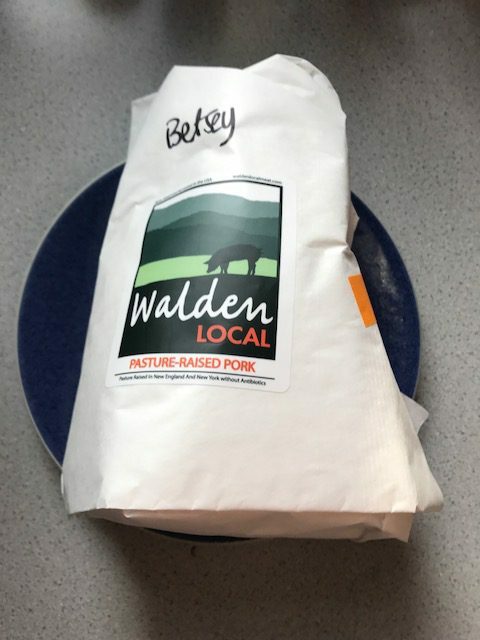 Walden Local buys animals from small farmers in the Northeast. They have a meat CSA, and this is their first retail shop. The cuts in the meat cases were gorgeous. Each offering was labeled with the farm from which it was sourced. They also sold jars of leaf lard, something prized for making the flakiest pie crust, but I’d never seen it for sale before. I asked if they had any ham hocks. Not smoked, the butcher said, but there are a couple of fresh ones. Perfect! I’d have to wait because they were in the process of breaking down the animals, so it wasn’t quite ready yet. Must have still been attached to the pig we saw hanging in the back cooler. We were on the way to see a play, so I said I’d come back after the show. When we returned, she had a package waiting for me. When I unwrapped it at home, I found some of the most beautiful pork I’ve ever seen. The recipe for cassoulet could seem a little intimidating. There are several components to prepare, but these can be done in advance, making the final assembly simple. Even if you do some steps the day before, the cook time is lengthy, so you want to make this on a day when you’ll be home all afternoon. First step is to cook the ham hock, which takes about 2 hours. 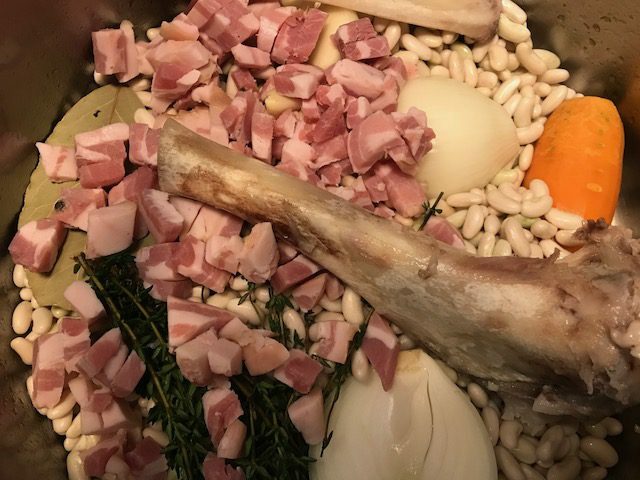 Next, soaked beans are cooked with the ham bone from the hock and other aromatics including diced pancetta, carrots, onions, garlic, thyme, and bay leaves until the beans are tender. My beans were so fresh that it only took about 45 minutes. I did these steps the day before I was going to make the cassoulet. I stored the shredded pork from the ham hock, the drained beans, and the bean liquid in the fridge. I decided to separate the beans from the cooking liquid just in case storing them together caused the beans to get too soft. The next day, when I was ready to assemble, I recombined the beans and liquid in a pot and added the pork and the carrot, now diced. I browned the sausages. Howard browned the duck confit (family project). Time to layer. I halved the recipe, but still chose used a wide heavy cast-iron pot so the layers weren’t too thick. A layer of beans was topped with one duck leg, cut into several pieces, and some slices of sausage. This sequence was repeated, then topped with the remaining beans and enough liquid to almost cover the beans. Finally, breadcrumbs moistened with oil covered the top. I found the next part confusing. After an hour, you break through the crust on top of the casserole. I assumed this meant the breadcrumb crust. The cassoulet continues to bake, and you are supposed to break through the crust two more times. This resulted in most of the breadcrumbs being turned into the casserole which contradicts the picture in the book (and accompanying many recipes I found in a web search). I found a few recipes that didn’t add the breadcrumbs until the very end, and for those recipes, it seemed that the beans themselves formed a crust to break through. I am curious to see what happened with the other cooks. However, independent of the top crust, the cassoulet itself was fabulous. Stick-to-your-ribs fare for a cold winter evening. I would make this again. It would be the perfect centerpiece for a dinner party. The recipe includes reheating instructions that involve a hour of bringing the casserole up to room temperature before heating in the oven for an hour-and-a-half. I reheated leftovers in the microwave, and it was perfectly fine. My only “note to self” for next time is to remove all the duck from the bone. Per the recipe, the thigh was divided in half and the drumstick left whole. The bone was a pain to deal with when serving. The meat was falling off the bone anyway, so I think it would have been nicer to have shreds of the duck meat and skin instead of the larger pieces. 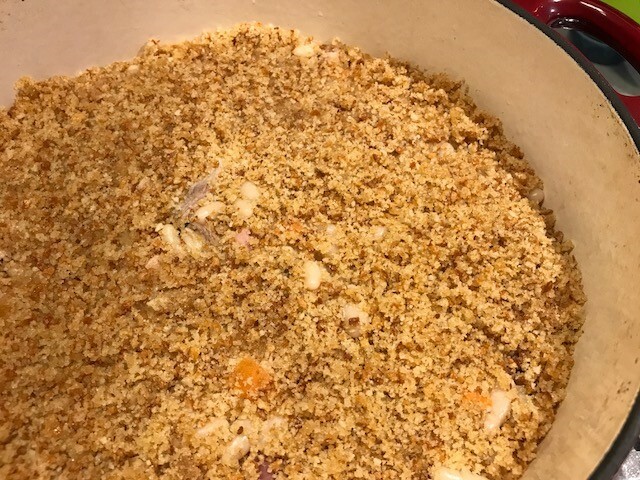 Here are some fun tips on cassoulet from David Lebovitz’s website. 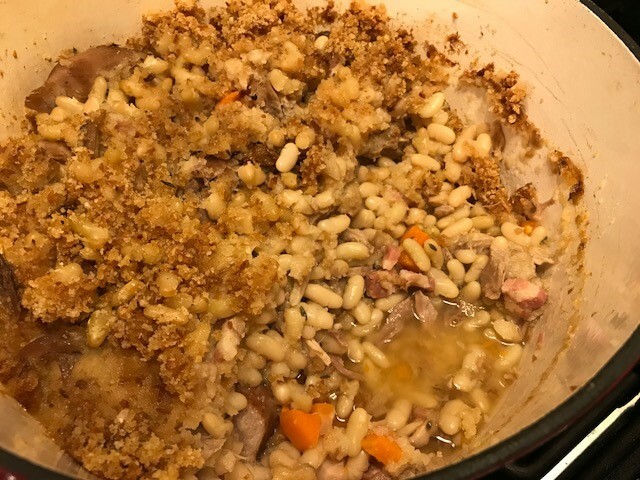 The cassoulet is a top-contender for my favorite recipe from My Paris Kitchen so far. You can find the recipe on page 195 of David Lebovitz’s My Paris Kitchen. To see what the other bloggers from Cook the Book Fridays thought, follow their links here. Duck confit is a favorite in our house. It’s usually Howard’s job to make it. Duck confit is one of the first of his sous-vide projects that he perfected. As ridiculous as it sounds, homemade duck confit, stashed in the freezer, is often “emergency food” (i.e. what’s for dinner when you don’t think there’s any food). Just thaw a pair of legs, whip up a pot of lentils plus a green vegetable or a salad, and a spectacular dinner is on the table in no time. Me, I’m more low-tech. No water-immersion circulators for me. 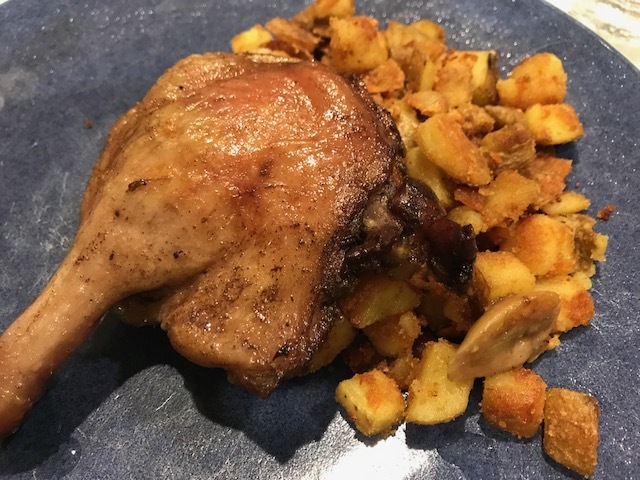 I was excited to try out Counterfeit Duck Confit from David Lebovitz’s My Paris Kitchen for Cook the Book Fridays. This recipe couldn’t have been simpler. First, you use a needle to prick through the fat of the duck legs. 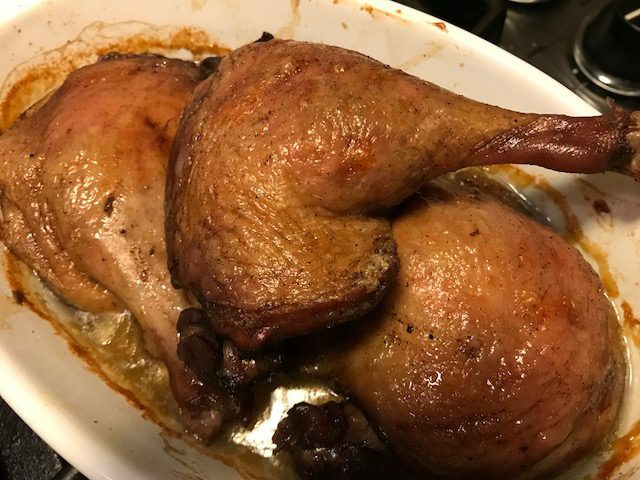 Then rub the duck legs with an aromatic mixture of gin, allspice, nutmeg, and salt and allowed to sit overnight on top of a couple of bay leaves and halved garlic cloves. The next day, wipe down the duck legs and then slow roast them in a low oven, no added fat. As the duck cooks, the fat starts to fill the baking dish, submerging the legs. Finally, the duck legs crisp up when the oven temperature is raised for the last bit of cooking. I didn’t pick the right baking dish. David wants the legs to be snug. I had one pan where the legs fit snugly, but not really in one layer. In the next bigger pan, the legs had more room, not what I’d call snug. I opted for the smaller dish, but I think that was a mistake. The parts of the legs that were immersed in the fat melted off the bone. The other parts were tasty, but just not as tender. 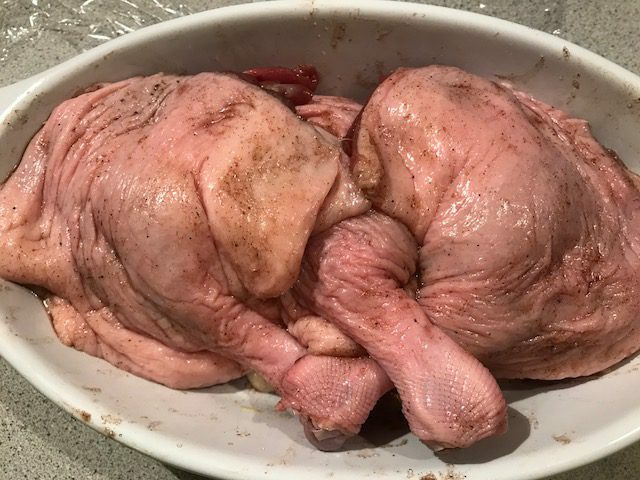 I think the trick is for all the legs to lie flat so they all can bathe in the duck fat, but with minimal extra room so that fat is as deep as possible. The duck was also a little salty. I wiped the rub off before cooking. Howard thinks I should have rinse the legs as he does. Despite being a little salty, the “fake” duck legs were delicious. In a throw down, I suspect Howard’s version would win. However, I like knowing I can make an excellent low-tech rendition on my own without investing in gobs of the requisite duck fat. Speaking of duck fat, the rendered fat was the most beautiful golden color and perfectly clear. I’ve saved it for pan-frying or roasting potatoes. I also met Joanne Chang, owner of Flour. Her newest cookbook is savory not sweet, recipes from Myers+Chang, the Boston restaurant she owns with her husband. Being more of a cook than a baker, I added this book to my collection and was able to have her sign my book. Again, no picture. The counterfeit duck confit is worth a try. You can find the recipe on page 179 of David Lebovitz’s My Paris Kitchen. Check out my friends’ reviews of this recipe here.